"The ELCA’s official Confession of Faith identifies the Scriptures of the Old and New Testaments (commonly called the Bible); the Apostles’, Nicene and Athanasian Creeds; and the Lutheran confessional writings in the Book of Concord as the basis for our teaching. ELCA congregations make the same affirmation in their governing documents, and ELCA pastors promise to preach and teach in accordance with these teaching sources. This Confession of Faith is more than just words in an official document. Every Sunday in worship ELCA congregations hear God’s word from the Scriptures, pray as Jesus taught and come to the Lord’s Table expecting to receive the mercies that the Triune God promises. Throughout the week ELCA members continue to live by faith, serving others freely and generously in all that they do because they trust God’s promise in the Gospel. In small groups and at sick beds, in private devotions and in daily work, this faith saturates all of life. - See more here. "May the Grace and Peace of our Lord Jesus Christ rest upon this congregation now and always." When the church was founded it was known as "Clarkfield Norwegian Evangelical Lutheran Church". Through the years it has become much more diverse, therefore we are now known as Clarkfield Lutheran Church. The village of Clarkfield is located in Yellow Medicine County, MN, which is in the SW part of the state. Clarkfield is about 30 miles from the western edge of our county which borders South Dakota. We serve the City of Clarkfield and surrounding areas. 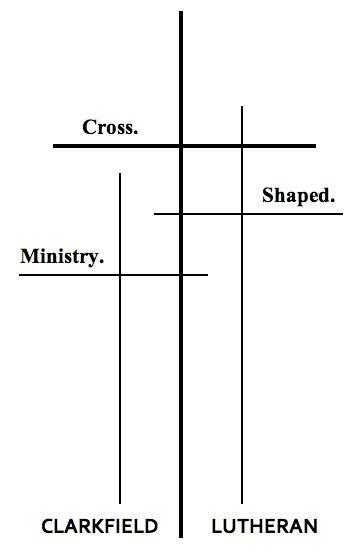 In 2012, the congregation adopted a new Mission statement: Shaped by the cross to do Cross. Shaped. Ministry. The cross of Christ is our salvation. By it our lives are shaped into lives of love and service to a hurting world. We are sent into the world to do this cross shaped ministry, loving like Jesus loved; that is, loving the world with our whole lives. The history of the congregation indicates a mission mindedness, a desire to bring the light of the Gospel to all people, that they may bring glory to our loving Heavenly Father. Clarkfield Lutheran has supported missionaries for nearly 50 years - starting in 1915. The first missionary was sent to China at that time. Currently we support Rev. Dr. Elisabeth Johnson in Cameroon, Africa. Money not sent to overseas missionaries are used to support other mission work closer to home such as Lutheran Social Services, Lutheran World Relief, ELCA World Hunger, Green Lake Lutheran Ministries, Clarkfield Area Charter School Backpack Program, SWMN of the ELCA, and more. Our ministry and mission continues through weekly worship, sunday school, adult bible studies, vacation bible school, confirmation, children's sermons and young adult activities. The Holy Spirit has called each CLC member to serve where he/she can and in whatever capacity she/he can in order to serve our risen Lord and to bring the good news of His resurrection to all who will hear.